Ike is approaching. Our local news tonight said Austin had opened 75 emergency shelters to hold 36,000 evacuees. They're asking for food and blanket donations. Interstate 35 is bumper to bumper (a block from my apartment complex). Ike is expected to reach Category 3 by landfall. 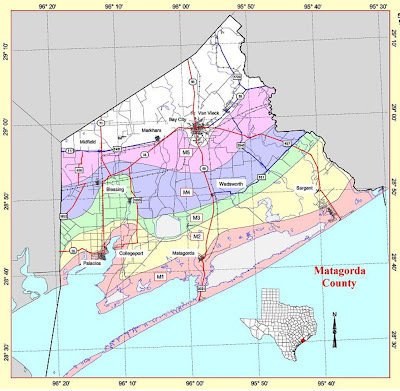 The National Hurricane Center issued a warning for Matagorda County which the local meteorologist read on the air, saying he had never in his career heard them say such a thing: "In Matagorda County, people remaining in a single family one or two story home face certain death." 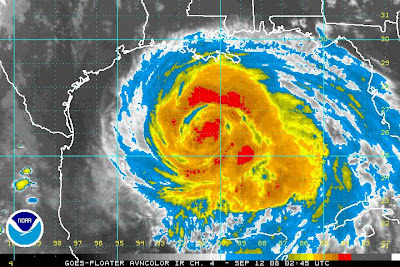 Ike is larger in area than Katrina was. This is a beautiful, fairly rural stretch of the Texas Coast, smack in the middle of the biggest bird flyway in the U.S. I lived in Palacios as a baby, and have gone birding in this area often. Tonight, however, I'm worried about all the people who can't travel. The current path shows landfall slightly west of Galveston or directly over Galveston. With storm surges of 9-12 feet and the seawall only 10 feet, Galveston is worried about flooding. The wind damage, however, will come one county over, which is Matagorda: Counter-clockwise winds hit from the north and west. If Ike continues as predicted, Austin will be hit with tropical storm strength winds as it passes to the east of us. I'm not worried about wind damage, because my windows face south and are few. I'm also on an elevation, so I've never had flooding. But a prolonged loss of electricity, which happens here with big storms, is concerning to me. Likewise the tornadoes that sprout on the edges of hurricanes. If my power goes out, you won't see me on line for while, but I'll be okay. I'll get help from a neighbor, if need be. I'm not who needs your prayers and assistance. To track this storm via the National Oceanic and Atmospheric website, click here on NOAA. Please share news here as necessary.